Zipp Kits 33FE Fast Electric Outrigger Kit with NO Cowl. 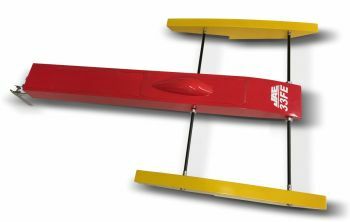 This is the Fast Electric version of our world record holding JAE 21GT nitro outrigger kit. The JAE 21 holds numerous oval and straightaway records. Designed by IMPBA Hall Of Fame member Rod Geraghty. This hull is the current state of the art for riggers, and currently holds the record for the fastest ever 2 laps on a 1/4 mile course. Designed for very low hydrodynamic drag with water shearing and anti capillary features, this hull is fast, and turns are incredible! This version was optimized for heat racing by Martin Truex, Jr.
-This is considered a full kit, as it includes carbon boom tubes, aluminum boom tube collars, 7075 aluminum turn fin. -This kit is highly pre-fabricated, and assembly is easy, thanks to the 33 page photo illustrated, step by step assembly manual. -Designed for 4S operation to 6000+ mah, the 33FE will accept smaller (4500 mah) 6S setups as well. We made the center section big enough for any motor and ESC you want. Want to run a 3674? No problem. 4082? Bring it. *Picture is of a painted and finished JAE 33 Rigger. Kit comes in wooden parts that need to be assembled and painted.